One year and a few days ago, Houston faced the coldest days on record in fourteen years. Whenever the weather turns cold, my thoughts turn to the homeless who live in the blurry shadows of our peripheral vision throughout the city. 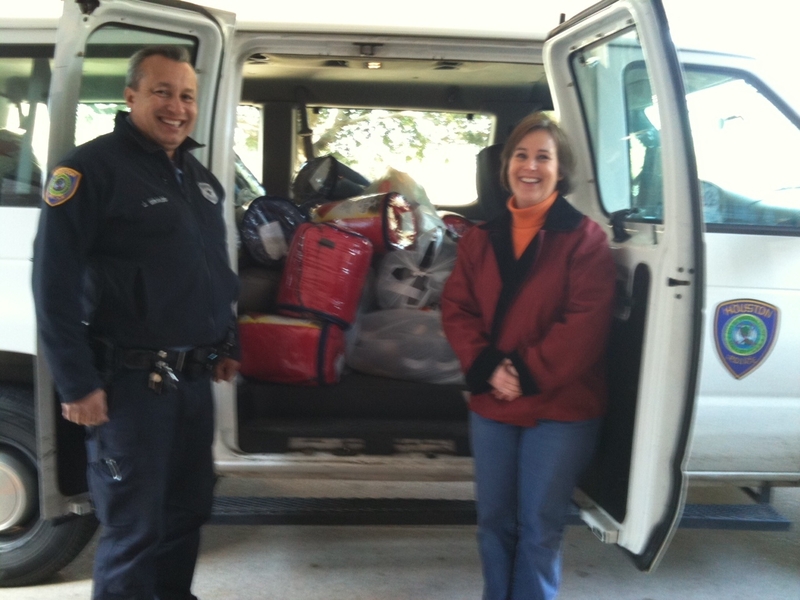 Last January, our missions ministry organized a last-minute coat and blanket drive to help the homeless. And, the people of Kingsland responded by providing enough items to fill a twenty-four foot U-Haul truck. We delivered the items to one of our urban ministry partners who then distributed these bundles of warmth to Houston’s homeless. There is no way for us to comprehend what it must be like for those who live and sleep on the streets, especially when the temperatures plunge. Not all of the homeless make it into shelters when the weather turns cold. Many stay on the streets. For these unfortunate individuals, an additional coat or blanket may mean the difference between life and death. Once again, Houston is experiencing its coldest days on record this winter. Yesterday, my friend Gil Harris introduced me to Houston Police Department Officer Jaime Giraldo. Officer Giraldo is one of three officers assigned to HPD’s new Homeless Outreach Team. This team is responsible for compassionately connecting with and assisting our city’s homeless population. Our discussion turned to the cold weather, the challenge of getting the homeless into shelters, and the many homeless people who never make it into warm shelters. Because of the urgency of the situation, I asked Amy Granger, our missions ministry assistant, to recruit some of our volunteers to shop for sleeping bags, blankets, warm caps, and gloves. Officer Giraldo stopped by to pick up these items this afternoon. He and his partners will distribute these items to the homeless who will need this extra protection to make it through the cold weather forecasted to be with us all week. I am grateful to the people of Kingsland whose generosity makes it possible for us to respond quickly in times of need. And, I am thankful that Houston’s Police Department has appointed a new Homeless Outreach Team. I promised Officer Giraldo that our missions ministry will continue to assist him and his partners in their efforts to help the homeless. Let’s remember to pray for the homeless and for HPD’s Homeless Outreach Team as they work to help the homeless. And, remember that we too are responsible for helping the homeless and the least of these. Toss an extra blanket or a coat into your car along with a few snacks stuffed into the pockets. Then look for an opportunity to help the homeless as you drive around our community. Your act of kindness is sure to warm hearts — your own and that of the person you bless. One thing our church did recently is to send blankets to the Sudan. My spouse and I bought a blanket to donate. I am not sure on the final count, but it was a joint effort with a few other churches in the area. Yes, the cold is unbelievable. It was impressive yesterday in the DFW area. The ice storm awakened us at around 4 a.m. with the sleet hitting the bedroom windows. I continue to be grateful for your impact on my life – the constant reminder that Christians should look like Jesus – full of compassion and love! Thanks for your kind words. Great news on the blankets for Sudan. I hope to go there later this year. The need is great. Thank you for hearing these, from you.